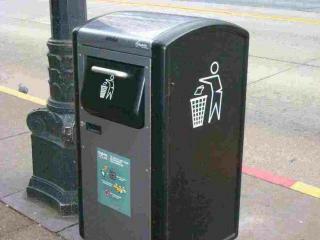 Philadelphia has replaced 700 downtown trash bins with 500 high-tech compactors, which use solar energy to condense trash — cutting down collection trips by 75 percent. Facing a billion dollar budget deficit, the city estimates it will save $875,000 a year with the compactors, bought with state grant money. Cities from Vienna to Boston to Vancouver have tried the devices in smaller numbers, but Philadelphia put them along four collection routes in its heavily traveled downtown area.